Businesses with more than 1 location - Comparing one of your locations to another for the same period, have you ever wondered what an actual day's sales and collections looked like without the collections and adjustments from prior days being reflected on the reports? Do you want a true picture of daily sales and daily collections related to the date of service, regardless of when the fee slips were recorded? Are you curious what % of patient amounts due the staff is collecting comparing one location to another? Are you curious how each day's sales compares to other day's pure fee slip sales comparing locations? Are you curious how each location compares with the discounts they are giving to patients? Did you ever want to know how each location compares with the credit card collections vs. other payment types with little cost? If you answered yes to any of the questions, you should get these graphs. They report visually the sales by day or period and match the sale to the collection that occurs on the same day. Discounts, Packages, Insurance Discounts given on the day are shown by location. Another Graph shows the patient collections received against the fee slips for the same selected period. Another compares the % collected at each location - why does one location collect 80% on the initial visit and another only collects 60%? A final graph shows the various payment types used to pay the charges - why does one collect a higher % of credit cards than another? This graph compares by locations the Gross Fees and Discounts and Adjustments made during the same period against the same fee slip(s). It is a true reflection of the period's results for patient sales and fees collected. No collections or adjustments for other day's activities are reflected in this graph. This graph compares the Discounts, Package Discounts and Insurance Discounts given to patients at the time of sale. Allows a quick comparison to see if the locations are comparative and if not questions can be asked why. This graph shows the Patient fees charged plus co-pays - the total amount due at the time of visit. Another graph shows the % collected and the amount collected at the time of visit. This is a true cash basis picture of what is being charged and should be collected for the period if the idea is to keep receivables low. 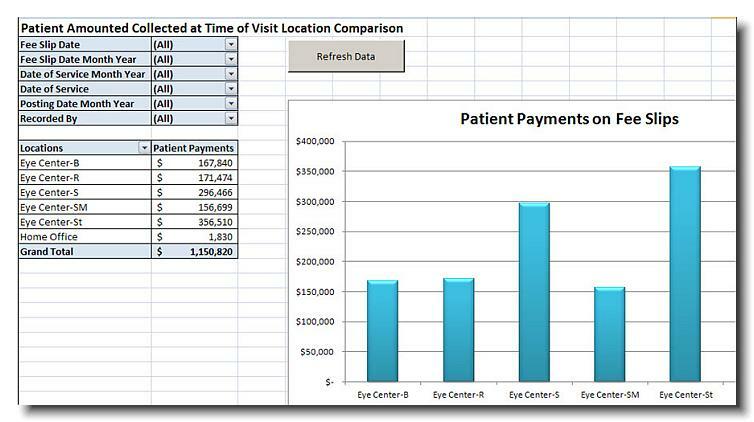 This graph compares the percentage of the patient charge that is collected at each location at the time of visit. It will give you a comparison to ask why the collection percentages are different at different locations. This graph compares the amount of monies collected at each location for the specified period. It is a true reflection of cash generated by period by location for the pure sales of the period - it is not hindered by any payments or adjustments related to any other period. This is a cash basis reflection of the cash generated by period. Broken out by Payment Method, this graph lists the collections made against the fee slips recorded for the same period, or on the same day. No advance payments or payments against receivables are reflected in this report. It is a true reflection of fee slip collections made for fee slips recorded by payment type.